A neighbour who happened to have a career as an Archaeologist first inspired my interest in crystals. I was a very curious youngster, and i remember my neighbours garden contained a collection of rocks and shiny stones! My mind was often preoccupied with these objects and as I grew older my curiosity grew. I began to learn all about these interesting rocks and crystals… ! My uncle also happened to have a Prism; placing it in sunlight produced a spectrum of vivid colours that I found amazing! The depth of colours always made me feel a sense of wonder – white light through crystal changing into colours of the rainbow. Marvelous! My early childhood interests gradually became my lifetime interest. During one particularly difficult period in my life I suffered serious ill health. I came to appreciate the positive power and energy of crystal treatments. I realised that symptoms of poor health were often linked to other stressful problems encountered in everyday life. I decided to try and help people benefit from my own experience and decided to establish a base to carry out my work. My aim is for the shop to be a beacon of light, situated in the centre of Britain, effectively in the ‘Heart of the Shires’. This location makes us accessible to almost three quarters of the country within a fifty mile radius. I want ‘Heaven’ to help bring a planetary balance through treatments and information to people from all walks of life, making us aware of our own abilities and greatness! 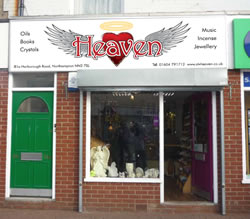 We offer a range of items including crystals, incense, oils, tarot, jewellery . We take great care and pride in our choice of products chosen for our customers and I think this reflects the standards we want to achieve for you. We are co-creators on this beautiful planet, moving into this ‘Golden Age’, with all its gifts there for us to experience. The future is firmly in our hands now. So take some time out and visit ‘Heaven’. I’m sure you won’t be disappointed! If you should have any questions, please feel free to contact us. The details and nature of all our customers is treated as a private matter and confidential.